A REAL high-speed camera you can actually afford! 720p 1,500fps in the palm of your hand. Now in stock! 224 backers pledged CA$ 594,658 to help bring this project to life. We'd like to thank all of our backers and everyone who liked, shared and otherwise supported the project for making Chronos 1.4 such a huge success! We couldn't have done it without you! Chronos 1.4 is a purpose-designed, professional high-speed camera in the palm of your hand. With a 1.4 gigapixel-per-second throughput, you can capture stunning high-speed video at up to 1280x1024 resolution. Frame rate ranges from 1,057fps at full resolution, up to 21,600fps at minimum resolution. At Kron Technologies, we have a passion for high-speed imaging. You should be able to pull a high-speed camera out of your bag and start shooting, rather than fumbling around with a computer and cables. That’s why we created Chronos 1.4. We started on the journey that lead to Chronos because we believe high-speed imaging should be for everyone, not just scientific research labs and TV productions with massive budgets. Our passion has resulted in a camera that’s disrupting the high-speed video industry. Cameras with similar features currently sell for around $25k. 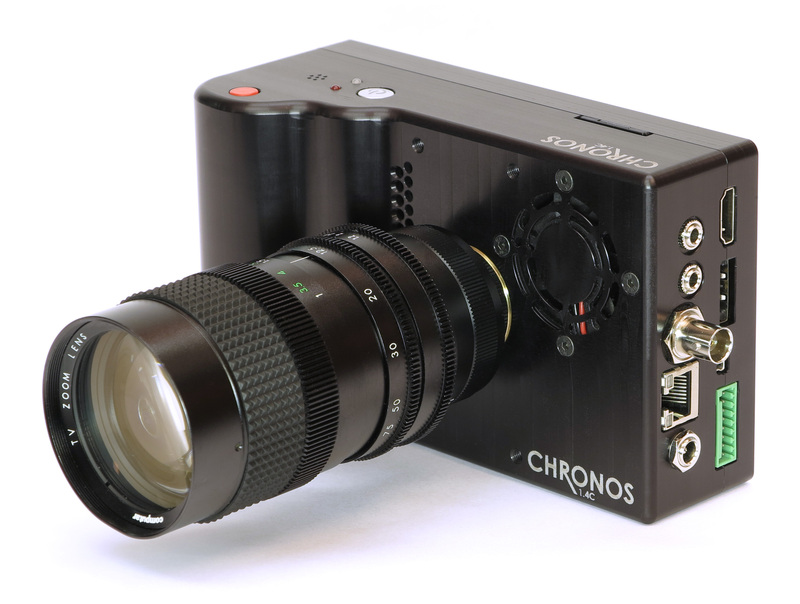 Chronos is about 1/10th the price, with more features, smaller size, and far better usability.. You can buy a Chronos for less than the cost of renting a typical high-speed camera for a week or two! We'll develop and release an Android app on Google Play that will be able to remotely control one or many Chronos cameras, view live video, and view/save recorded video to your phone or other storage devices. What can Chronos 1.4 do? * The camera hardware fully supports these features, software support will be added in a free software update after initial camera release. If you can use a smartphone, you can use Chronos 1.4. The camera is operated by capacitive touchscreen, with an intuitive touch interface. The UI is blazingly fast thanks to the native C++ compiled user application, based on the QT Embedded framework and running on top of Linux. Menus load instantly, and changing from record to playback mode happens in milliseconds. Unique to Chronos, the jogwheel gives you incredibly accurate control when playing back video. Move 24 frames per turn, or 960 when clicked in for fast seeking. After using the jogwheel, your PC's playback functionality will leave you disappointed. Once the Chronos 1.4 is released, the full source code and development environment for the camera’s user application will also be released. Savvy users can modify the operation of the camera, add features, and contribute to improve the software for everyone. Video is recorded to RAM from the image sensor, and is stored as raw data. The raw processing can be adjusted right on the camera*, including demosaic type, color matrix, and white balance, all without having to retake a recording. Once you’re satisfied with the settings, the video can then be saved to a ready-to-use compressed video file. Of course, you can also save the RAW data* directly for processing later on a PC. * These features will be added in a free software update after initial camera release. C Mount and CS mount lenses are supported out of the box. The camera body itself is CS mount, and includes a CS to C mount adapter. Virtually any lens type can be used with an appropriate adapter, including Nikon F, Canon EF, and PL Mount. The camera’s 2/3” sensor is a perfect match for C mount lenses. Zooms are readily available in apertures as wide as f/1, something completely unheard of in DSLR lenses. A vast selection of lenses are available from your favorite supplier, or you can get the following lenses included with your camera as add-ons. Simply increase your pledge by the total (in CAD) for all the lenses you'd like. The backfocus is easily user adjustable, allowing parfocal lenses to maintain proper focus throughout their zoom range. Loosening a set screw on the bottom of the camera allows the backfocus ring to screw in or out for adjustment. Unlike competitors who use either no battery, bare 18650 cells, or proprietary packs, Chronos 1.4 uses standard Nikon EN-EL4A batteries. These are readily available for as little as $25. We all hate non-user-replaceable batteries, so the Chronos battery is field swappable, without any tools! The battery lasts for about 1.75 hours of continuous recording per charge. Note: HDMI, Audio, Ethernet and analog inputs are fully supported in hardware, but not yet in software. A free software update will be released after the initial camera release to enable these features. Chronos is available in color and monochrome versions. This isn't just a software change, the mono version has a native monochrome image sensor lacking color filters This leads to twice the light sensitivity and slightly higher effective resolution. Comparison of mono/color. Also see the Tech video above at 0:50. Kron Technologies’ founder, David Kronstein, has had a passion for high-speed imaging since seeing the amazing things Mythbusters was doing back in the mid 2000s. Unable to afford a real high-speed camera as an electrical engineering student, he set out to build his own. This passion is what drove the creation of Chronos, and all the prototypes leading up to it. Lenses are available for any camera as add-ons. See Lens section above. We need your support to get Chronos 1.4 out and into people's hands! To get costs down, we need to build a large batch to get volume discounts on parts. That's where you come in. By supporting the project, whether with a complete camera or a smaller reward, you help bring affordable high-speed imaging to everyone. Chronos 1.4's hardware is fully operational and ready for production. The user interface software that runs on the camera supports basic recording functionality sufficient for most users. We will release software updates regularly adding new features, at no cost. Earlybird rewards are scheduled to ship mid March. Normal rewards should ship early-mid May. This schedule assumes a large batch build for normal rewards. If the number of normal rewards is small, we'll do only a single build, and all units should ship in March. David is an electronics engineer with a wide range of experience: FPGAs, image processing, software, and mechanical design. He worked at companies such as Delta-Q Technologies, Verisante Technologies, Mistywest, and Signal Laboratories, gaining experience in product design and development in both low- and high-volumes. 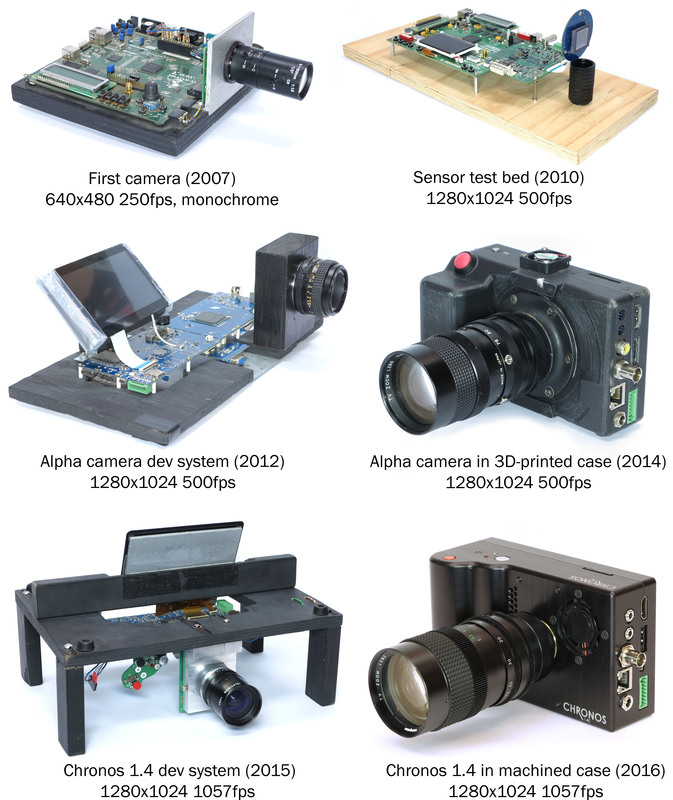 His passion for high-speed imaging started in 2006 and has culminated in Kron Technologies Inc. and this Kickstarter. In his spare time, he runs the tesla500 Youtube channel to share projects and knowledge. Loial has nearly 10 years of product design experience, half of which is in electronics design. The rest falls into additive manufacturing (3D printers), motion systems and fabrication. He also has a porfolio of shipped products where he's assisted or been the lead on everything from designing enclosures through programming device drivers. The major risk is supply chain issues causing parts to be unavailable or delayed. We’re keeping the cost of the camera low by using commodity parts. The vast majority are common and readily available off the shelf. Some may be susceptible to having long lead times. We’re tracking the lead times on these parts and purchasing in advance if necessary. Any parts that are likely to go out of production are minor and can be easily worked around in a batch based build. Another minor risk is failing FCC part 15 emissions testing. Our lead engineer has successfully seen several products through this approval, and proper precautions have been taken in the camera’s design to make passing easy. Allowance has also been made in our schedule for a PCB respin to incorporate any unforeseen changes required to pass testing. Chronos 1.4 is ready for production. We’ve already built a run of 12 units for testing and promotion. Initial production yield was 100% after one minor rework (solder bridge). The cases were made on our in-house CNC machine. We will use the same primary parts suppliers for the production run as for the prototype run. For a modestly successful kickstarter we’ll build the enclosures in-house up to about 25 units. Beyond that we’ll contract out to reputable suppliers. We have an excellent handle on the production costs based on our prototype build and are confident that we will be able to build and ship all rewards with Kickstarter funds. The initial production run will include extra units in case the production yield is not 100%. This will also allow us to supply future orders in a more timely manner. We will strive to keep everyone updated with any unforeseen delays. We pride ourselves on being open with our customers. Virtual fist-bump! Any help is greatly appreciated in bringing high-speed video to everyone. Support the camera, get videos! We'll send you a series of exclusive, super cool high-speed videos taken on the camera. Your name will also be included in an easter-egg menu on the camera and on the website. You’ll get even more exclusive videos, delivered on a custom Chronos flash drive. Your name will also be included in an easter-egg menu on the camera and on the website. Earlybird special! Receive an 8GB (4-second record time) Chronos 1.4 camera, your choice of color or monochrome, from the first batch. Earlybird special! Receive a 16GB (8-second record time) Chronos 1.4 camera, your choice of color or monochrome, from the first batch. Receive an 8GB (4-second record time) Chronos 1.4 camera, your choice of color or monochrome. Earlybird Combo deal! Receive a 16GB (8-second record time) Chronos 1.4 camera, your choice of color or monochrome, from the first batch, plus a 12.5-75mm f/1.2 zoom lens. Receive a 16GB (8-second record time) Chronos 1.4 camera, your choice of color or monochrome. Receive a 16GB (8-second record time) Chronos 1.4 camera, your choice of color or monochrome, plus a 12.5-75mm f/1.2 zoom lens.